A brilliant student, a creative painter and a quick learner, Mumukshu Shree Aradhana Didi is truly an all-rounder. When today's tech-savvy generation spends most of their time with mobiles, selfies and gadgets, Shree Aradhana Didi is an exceptional teenager who has never been fascinated by the materialism. On the contrary, she has an inclination towards gaining Aagam knowledge whenever she gets a chance. In spite of achieving success with flying colors and excelling in every zone she stepped into, she chose to pursue the valorous path of Pravajya! Mumukshu Aradhana didi Deliwala, daughter of Shrimati Poonamben Manojbhai Deliwala, has taken the brave decision of adopting Jain Diksha at the young age of 17 years. Born and brought up in Rajkot, she has recently completed her S.S.C. (Class 10) examinations from the Gujarat state board with 99.94 percentile, securing the 6th position across the state from among 11 lakh students. Like the great warrior Shivaji who would sleep only after his mother Jijabai sung to him patriotic songs filled with fervour and motivation, young Aradhana would fall asleep only after her parents would sing to her the ecstatic Saiyam eulogy ‘Sadhu Vandana’ and the soulful ‘Ratnakar Pachisi’. Today, at such a tender age, Aradhana didi has already learnt and mastered Samayik-Pratikraman-Shri Avashyak Sutra, Shri Puchhinsunam Sutra, several Gathas from Shri Dashvaikalik Sutra and 100+ Jain stavans and hymns. Like her mother, she has never tasted or consumed root vegetables in her life! Coming from a family that is rooted with Jainist values and has produced gems in Jin Shasan, Aradhana didi is the niece of Rashtrasant Pujya Gurudev Shree Namramuni Maharaj Saheb (his sansari sister Poonamben’s daughter), maternal grand-daughter of Pujya Prabodhikabai Mahasatiji, cousin sister of Navdikshit Pujya Param Vibhutiji Mahasatji and niece of Limbdi-Gopal Sampraday’s Pujya Nehalibai Mahasatiji. 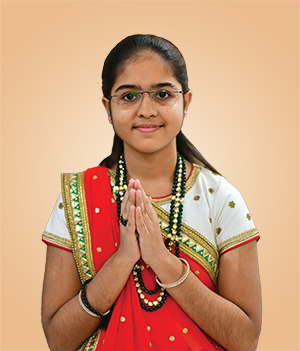 An exemplary student of Look N Learn Jain Gyan Dham, she now aims to fly high with excellence in Prabhu Mahavir’s Jin Shasan and eagerly awaits to adopt Shree Bhagwati Jain Diksha!